TelexFree, an MLM “program” that requires participants to pay back the company 20 percent of their earnings in one fell swoop, is positioned on You Tube as “The Hotest [sic] Deal In The World.” There were earlier claims that the money did not have to be paid back. UPDATED 6:14 P.M. ET (U.S.A.) TelexFree members who wish to maintain their position in the “program” and are nearing their one-year anniversary dates will receive an invoice from the company for 20 percent of their program “income” and must pay it within 10 days, according to a recording of a Nov. 15 TelexFree conference call. “On all the existing contracts, there is a 20 percent renewal fee, which will be based on your income generated from the previous year,” said TelexFree executive Steve Labriola. But in a video dated May 11, 2013, and playing on YouTube, TelexFree members attending a company event were told by various speakers that the 20 percent fee had been removed from the contract. The claim raises questions about whether untold scores of TelexFree reps joined the “program” believing the contract requirement to pay back 20 percent to TelexFree had been waived. The May announcement of the fee removal, confirmation of which was attributed by speakers to Labriola in the “back of the room,” was met with wild cheers. “You have to appreciate the heart of this company,” a second man said from the stage in the May video. TelexFree appears to have held a “Super Saturday” event at a Hilton hotel in Orlando, Fla., on May 11, the same date of the YouTube video. One of those cheering the asserted news in May was veteran “opportunity” pitchwoman Faith Sloan, late of Zeek Rewards and Profitable Sunrise. It appears, however, that TelexFree either never removed the fee or quickly reinstituted it when it recognized that millions of dollars of revenue it had anticipated when the “program” approached its anniversary date and first-in members approached their anniversary dates would vaporize. Other offering materials suggest that some of the asserted leaders who once protested the fee as unAmerican and announced its removal now have emerged as champions of the fee. If their downline members pay, it could keep the leaders on the gravy train. How much revenue was driven to the firm based on assertions the fee had been waived is unknown. Because some TelexFree promoters also pitched the alleged $600 million Zeek Rewards Ponzi scheme and may be targets of clawback lawsuits to return ill-gotten gains, their ability to address any invoice from TelexFree may be challenged. Some TelexFree promoters also pitched Profitable Sunrise, which the SEC described in April 2013 as a murky international pyramid scheme. How TelexFree members who already might have spent their earnings will address the invoice is unclear. TelexFree itself is under investigation in Brazil, amid pyramid-scheme allegations. In the Nov. 15 call, Labriola suggested some promoters will owe TelexFree sums ranging from $1,425 to $200,000. The more the earnings, the more owed TelexFree through the 10-day invoice. The pyramid probes in Brazil were not addressed in the Nov. 15 call. One of TelexFree’s electronic payment vendors limits individual transactions to $500, Labriola said. “All you need to do if you’re paying a $1,425 invoice is do it in three different . . . you can pay it in three different amounts: $500, $500 and $425. And you can do it all in one transaction,” he said. Members also can pay with back-office earnings that have not been withdrawn, by check or by ACH transactions, Labriola said. TelexFree will introduce new products in the near future, Labriola said. One of them will be a cell-phone product, but TelexFree members aren’t permitted to identify the four carriers, he said. In the meantime, TelexFree members should continue to recruit, he said, suggesting that the new offerings could help members overcome the sting of an invoice for 20 percent of their earnings. Labriola also warned members not to cross recruit, suggesting they’d lose their TelexFree distributorships if they do so. Some members facing an invoice for 20 percent of their earnings, however, may see no other option than to dump TelexFree and take their downlines with them in favor of another company that does not require a 20 percent payback to the firm at the one-year anniversary of membership. It is possible, though, that some members will pay the piper 20 percent, viewing it as the only means of protecting anticipated earnings and enabling continued payouts from TelexFree beyond their anniversary dates. If something goes amiss with TelexFree beyond the current situation in Brazil and investigations spread around the globe, the decision to pay could be one members live to regret. 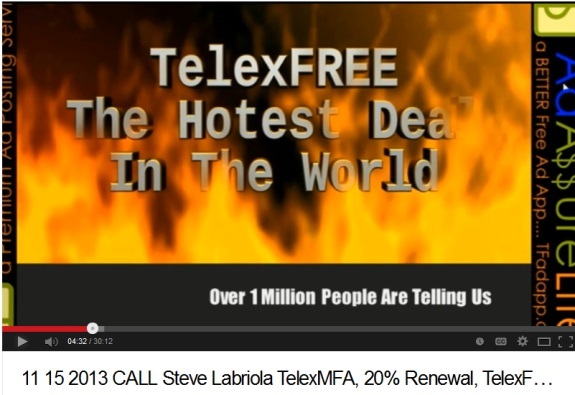 Promos for TelexFree began to appear on the Ponzi boards roughly in the mid- to late summer of 2012. There are claims that more than 1 million participants joined. Given the dates of the early Ponzi-board pitches and the time it takes for a “program” to gain a head of steam, untold thousands of people now may be approaching their anniversary dates. Oh, that’s pretty hilarious. Holding the people’s accounts as hostage and demand ransom. If this doesn’t prove they’re a scam to the participants, they are truly delusional. Just like the televangelists, except they want an additional 10%. still amazed people will continue to tow this line..
Just like the televangelists, except they want an additional 10%.still amazed people will continue to tow this line..
Suprisingly I know another group of “televangelist”(mostly from night infomercials) that much worse than these scammers. This is a slightly uninformed article. TelexFree is a U.S. company formed in Massachusetts that operates via WRITTEN CONTRACTS with it’s promoters, and those contracts spell out the 20% requirement. In order to “waive” that requirement, it would also have to be done in WRITING. Calling it “unamerican” is just a bunch of greedy, ignorant people who know nothing about the law. Note also, that the 20% requirement is OPTIONAL. Yes, you will lose your MLM position, but it’s left for the individual promoters to decide whether or not it’s worth preserving for that amount of money. FINALLY, I don’t know about what was said verbally and by whom, but the written contract controls. If Individuals misrepresented to other individuals about the 20%, the ignorant morons who signed up were legally obligated to read and understand the written contract. If it differed from what they were told, and they signed up anyway, they were on fair legal notice. And that’s the bottom line. And yet you REALLY know nothing at all about law. Not only was this would-be comment completely off-topic, it was straightforward spam. Some TelexFree affiliates even have spammed news reports in Brazil about suicides of TelexFree members.